E.C. Street was born August 16, 1879 near Boaz, Alabama. As a boy, his education came directly from his mom and he went on to study at the University of Alabama before getting a law degree from Vanderbilt. When asked about his career by the lodge members, he replied, “Law, law, law – just the same old routine!” When he first arrived in Waco in 1902, he began practicing law and was appointed assistant district attorney. He then operated a law firm in partnership with O.H. Cross. E.C. 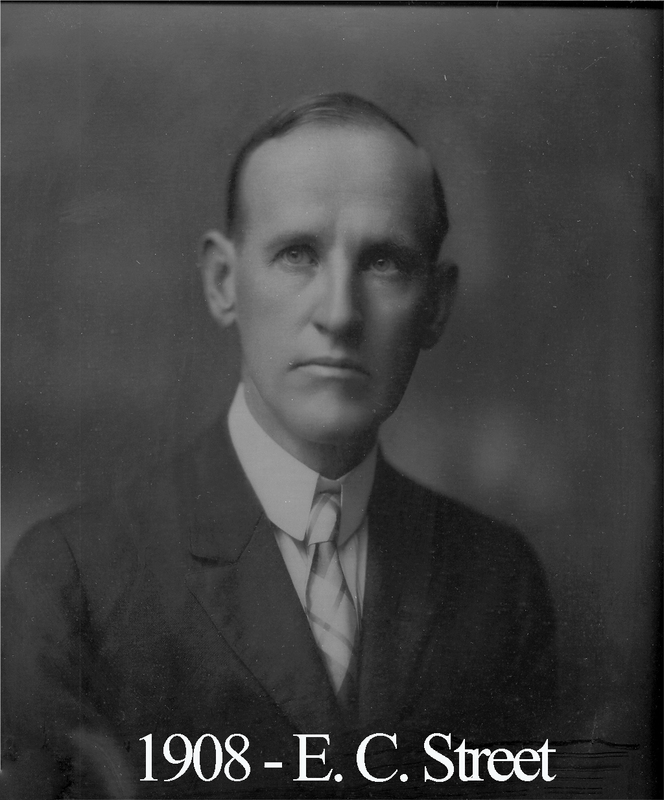 was Waco’s City Attorney from 1920 to 1922. Street founded the Pioneer Building and Loan Fund. He was a member of the Waco ISD school board for some time and a leading influence on the Waco Public Library. Street nearly met a grisly end in July of 1913 when he and a friend were driving back from a fair in Marlin. It seems that two mischievous boys tied a length of barbed wire so that it ran several feet high across the roadway. Street’s vehicle struck the barbed wire with such force that it ripped a number of fenceposts from their places and destroyed his windshield. The boys were arrested and Street recovered fully. For the second half of his legal career, he operated Street and Street law firm with his son, Tom Street. Politically, he was very active and sat as the executive of the county’s Democratic committee. He was known to be something of an expert regarding masonic poet Robert Burns and he was often invited to give speeches on that subject. Street also was president of the Fraternal Insurance Organizations of America. He had many hobbies changing from one to the next with a fiery passion for each. First, he raised chickens and then he graduated to Jersey cattle. After that, it was Belgian hares and then goldfish. He shifted gears to cultivating water lilies and late in life, he raised bird dogs. Street was also big in the stamp collection hobby. Above all, though, his greatest interest was in genealogy and he went to great lengths studying the history of his family and that of others. He became a mason at 92 in 1903 and sat in the East in 1907. Street was a member of Waco’s Eastern Star chapter for more than half a century. For several years, he served as secretary of our lodge and we still have the minutes he wrote and signed. EC Street lived long enough to see his son become master of the lodge in 1948. He and Tom Street have remained the only father/son duo to preside over Waco 92. EC Street lived at 612 North 22nd street for most of his life. In 1960, he was the only mason present at the opening of the cornerstone from the old Grand Lodge building who was also present at its laying in 1906.